At Namely, our mission is to help you build a better workplace. And we believe that great HR, payroll, and benefits technology is key to achieving that. That’s why we spend every day thinking about the future of HR tech, from how we can build features that streamline frustrating processes, to which tools HR leaders need to reach their full potential. The results—and the creativity that went into them—were so exciting that we had to share. Here’s a peek behind the scenes. While the hackathon itself lasted 24 hours, the preparations started long before. Employees were encouraged to form teams; judges awarded additional points for forming groups of at least three people. Fourteen cross-departmental teams sprung up, ready to take on the challenge. Everyone benefitted from internal expertise through a series of pre-hackathon workshops. These gave participants the chance to brush up on their skills before the clock started ticking. Teams could compete in one of four categories: Feature Enhancement (adding functionality to an existing Namely feature), Tools & Efficiencies (internal tools to improve processes), Tech Enhancement (performance improvements to existing features), and Moonshot (big, bold ideas that are outside of our current platform). There would be a winner chosen in each category, and prizes of $2,000 awarded to each winning team. Let the hacking begin! Photo by Andrew Persons. At noon, the hackathon started with a big bang: the distribution of Namely hackathon tees (quality swag) and lunch (creative fuel). Our CEO Matt Straz and CTO Teresa Dietrich presented the schedule, rules, and introduced the judges. And just like that, the teams were off! The hackathon was truly a 24-hour affair. In order to keep the momentum going for those committing to an all-nighter, warm cookies arrived at midnight from the aptly-named Insomnia Cookies. Glow-stick necklaces were distributed and disco lights switched on, giving everyone a burst of energy to get through the home-stretch. 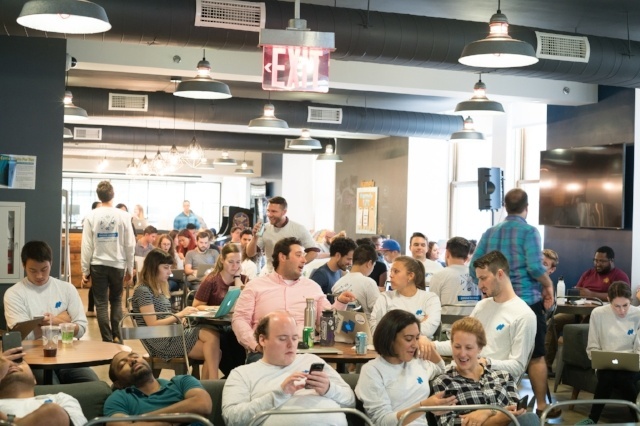 After the hackathon had run its course, employees packed into the kitchen to watch the demos. Presenting teams faced an impressive panel of judges. 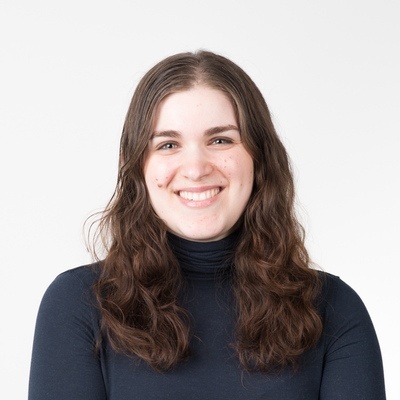 The judging panel represented a mix of Namely investors and client power users, as well as the CEO of one of our HR tech partner’s, Greenhouse.io. 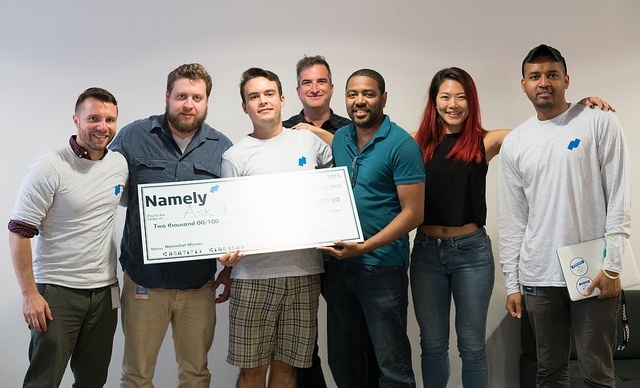 The hackathon provided them with a sneak peek into what ideas are on the minds of Namely employees—and how much we can deliver in just 24 hours. Team Namely crowds into the kitchen, ready for the demos to begin. Photo by Andrew Persons. While our @mentions feature encourages ongoing interaction between employees, Namely Recognition adds a performance management slant. The enhancement allows you to easily recognize your teammates. In turn, managers can see how often their reports are being acknowledged, providing constant opportunities to get a pulse on an employee’s performance. The feature was completely built from start to finish. Many insurance carriers don’t accept automated enrollments for clients of certain sizes. As a result, our benefits team processes thousands of forms. The benefits form builder takes this manual enrollment form process and transforms it into a seamless digital experience (auto-population for the win). Imagine if you were sitting in a meeting with an intelligent assistant, who was armed with all of your relevant HR data. That you could have instant answers to questions ranging from an employee’s job title to current company headcount or whether a conference room was available. Enter Namely’s take on the Amazon Echo. The answers to your burning HR questions are only a voice-command away. The Echo was so smart it even told the team when their demo time was up! The Ask Namely team collects their prize. Photo by Andrew Persons. A team of Namely payroll developers came together to dream up how the latest engineering technologies can be applied to Namely’s payroll interface. Their hackathon work laid a strong foundation for future teams to iterate on. While the goal of the hackathon is to build MVPs of fresh ideas, a few of our past hackathon ideas are now a part of the live Namely platform. So keep an eye out—you never know when one of these winners might become a reality.